British playwright, Alecky Blythe and her co-creator composer, Adam Cork, have created a whole new form of theatre—part documentary—part musical—part ritualistic communal catharsis.Rather than having a depressive effect, the result is uplifting. As the characters repeat their lines, sometimes singularly, sometimes collectively—the viewers root for them. They are drawn in as silent participants in the healing ritual…like congregants at a Catholic mass. The “songs” are short melodic sequences in a given location during set periods of time—outside the killer’s residence after he’s arrested; the courthouse during the trial, and in the community gardens cultivated in the aftermath. During the songs the singers repeat the same lines alternately reciting then communally chanting them; until the lyrics become annoyingly clear. The characters are not so much communicating with each other, as ridding themselves of the contamination that’s overtaken their psyche. The fact that the residents succeed in doing so, and in bonding together as a community by the end of the play, gives the production a positive overtone, in spite of the serious subject matter. Blythe became a citizen journalist, interviewing local citizens and recording their reactions to the discovery of a serial killer in their midst. In 2007, she worked with composer, Adam Cork, discussing the possibility of collaborating on a musical about the event. Cork felt that in order to remain true to the verbatim form, originated by Anna Deavere Smith, he would have to develop a new “speech-like way of singing” incorporating aspects of both music-theatre and opera. He couldn’t rely on the existing rules of either genre—but rather he would have to create something new in the rehearsal process. During rehearsals, Blythe gave the actors edited audios of her actual interviews instead of written scripts, so the thespians could emulate the cadence and rhythm of her interviewees’ actual speech patterns. The dialogue is fresh, alive and devastatingly honest—including all the humming and hawing of casual conversation. This is the speech of real people in real time. Although audiences will recognize Fiona Reid, Glynis Ranney, Julain Molnar, Deborah Hay and Ben Carlson from their performances at the Shaw and Stratford, individual actors do not stand out in this production. The emphasis is on ensemble playing and a sense of a choral reality—with an epic sense reminiscent of ancient Greek dramas. Director, Jackie Maxwell, has used a light touch in keeping the production moving. The characters never get bogged down in the emotions of the moment. The pace is steady, regular and progressive. There is a real sense of what it was like to live on London Road. Movement director Valerie Moore’s s choreography produces some fascinating visual patterns and configurations as the eleven characters arrange themselves on stage. Set designer, Judith Bowden, has produced some stunning visual techniques—the large suspended baskets of blooms set against a bleak backdrop—suggests a feeling of optimism and hope. The black and white projection of the actual street gives an eerie sense that this could happen anywhere. 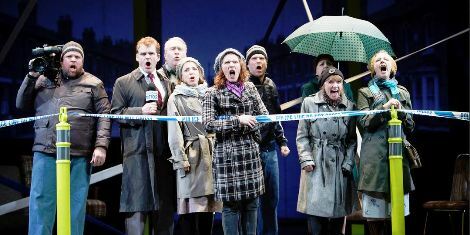 The police ticker-tape that crosses in front of the characters effectively captures the entrapment of the residents as hundreds of officers storm their neighbourhood. The minimalistic set reflects the uncluttered mind set of a people who choose to believe they are not living in a red light district and wish the prostitutes would just go away. There is a sadness underneath the optimism. These characters/citizens have been forever changed. And although they are ordinary, Blythe has made them into universal anti-heroes in their struggle to survive. This production is a must-see. London Road runs until Feb. 9th.